Our team at Cascade Vacation Rentals looks forward to helping you have a very nice vacation along the North Shore of Lake Superior. We have over 200 vacation rentals along these beautiful shores from Duluth in the south up through Grand Marais and Hovland near the Canadian border. Select a vacation home or vacation condo from various communities along Lake Superior's North Shore. We have pet-friendly vacation rentals too. If we can help you select the best rental for your family or group, please give us a call or email. We'll do everything we can to help make your vacation a memorable one, for years to come. The pricing you will see is based on 1-2 people. For parties of 3 or more, and extra fee may apply. Have you stayed with us before and are looking for something new? Check out our most recent additions. The properties listed in this category joined our rental program in the last year. The Aspenwood Townhomes are located on Lake Superior between Tofte and Lutsen near hiking, biking, skiing, golfing and more! These specials homes at the famed Bluefin Bay Resort have stunning views of Lake Superior. 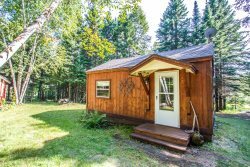 Located near prime hiking and biking territory, minutes from the Gitchi-Gami State Trail and Boundary Waters Canoe Area. Select properties at Caribou Highlands managed by Cascade Vacation Rentals. The location at Caribou Highlands provides you easy access to the indoor and outdoor swimming pools, on-site restaurant and gift shop, including ski-in ski-out accommodations at Lutsen Mountains, access to some of the finest activity trails in all of North America, starting line for the Lutsen 99er and Superior Trail Races, nearby Superior National at Lutsen Golf Course and so much more. Devil Track Lake is a favorite destination for many. This is a perfect location for both summer and winter sports as well as prime autumn leaf watching or getting your spring fever on. Make some great vacation memories when you stay in this historic brick hotel. Built in 1889, it offers all of the classic charm of old Canal Park with its comforts of a high quality, modern interior. Looking to stay for an extended stay on the North Shore? These properties are available for a seven-night or month-long rentals. Grand Marais is a geological and cultural phenomenon and vacation destination with great beauty and good food. We have many Vacation rentals to select from, including vacation homes and cabin rentals. Vacationers enjoy boating, fishing and sailing and we have an awesome lighthouse too. A slow moving community between Grand Marais and Grand Portage with ample quiet and a steady flow of peacefulness. Enjoy your beautiful Hovland vacation rental on the north shores of Lake Superior. Many of our vacation rentals are on the shores or near one of our beautiful inland lakes including Devil Track Lake near Grand Marais, Caribou Lake near Lutsen and Poplar Lake near Gunflint Trail. Need help deciding where to bring Fido on vacation this year? Youve come to the right place! Check out our pet-friendly vacation rentals. For a small fee you can bring your pet on your next vacation. We love your pets, too! These cabins are for those who prefer to trade luxury for simplicity and uniqueness (and, of course, maybe even a spider or two!). Things classic log homes and off-the-grid escapes. These homes have easy access to snowmobile trails in the area. A good place to live, a popular place to vacation, Tofte is an incredible getaway into the North Shore wilderness. Fishing, hiking, cross-country skiing, snowmobiling, canoe and kayaking, hunting. Lovely fall color tours. Book a Tofte vacation rental today.